File contains photographs depicting close view of drill bits used in the Cassiar mine. The photos were taken for documentary purposes during an evaluation procedure in which the bits were tested and compared. 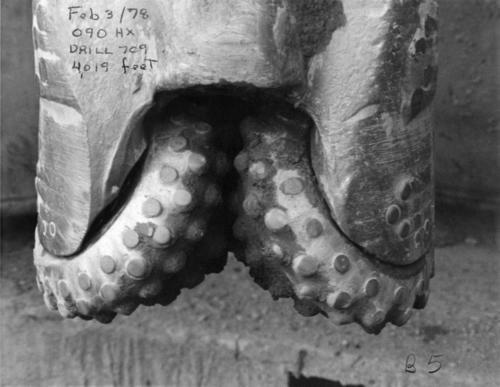 32 of the photos are adhered to three reports containing detailed analysis of the condition and function of the drill bits used. Reports were addressed to "E. Komperdo / Assist. Mine Superintendent, Production," and were sent by "Bob Clark / Industrial Engineer" and "E. Isaaks / Engineer Trainee." All of the photos are heavily annotated on verso and recto, often documenting the date, bit number, drilling depth, and notes on general condition. Arranged by archivist according to original numbers on photos. Number system used for some of the loose photos corresponds with photos adhered to the report.